Seeing the Grey-headed Flying-foxes of Bairnsdale, East Gippsland is one the world’s top wildlife spectacles. We parked the car and walked into the forest beside the river. The tree branches joined up over our heads, so looking up was a deep dark green with only patches of sky. In the distance, shrill calls could be heard, like birdsong but with an odd quality. 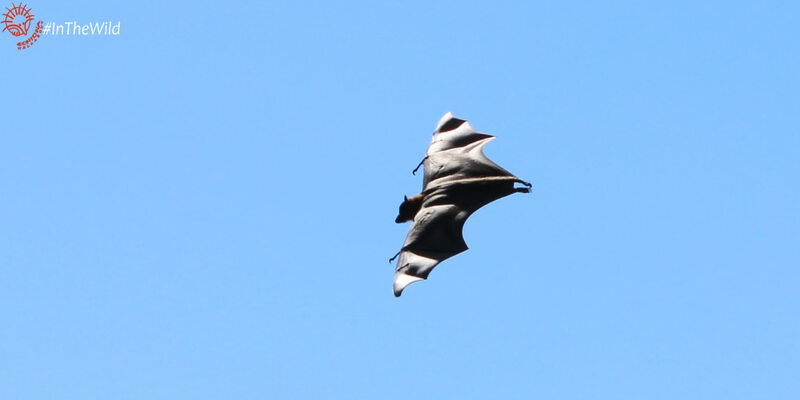 I knew the calls were Grey-headed Flying-foxes, but my guests from the UK and USA did not. Flying-foxes are creatures of the southern hemisphere and the tropics – there is nothing like them in Europe or North America. As we walked into the forest by the Mitchell River my guests walked slower and slower. The calls were louder here. My tourists were looking up and around, but even a bat with a one-metre wingspan can be difficult to find in the dark forest. Especially when you don’t know what to look for. As a Wildlife Guide, I want my guests to get the most thrilling, memorable & respectful experience of wildlife. 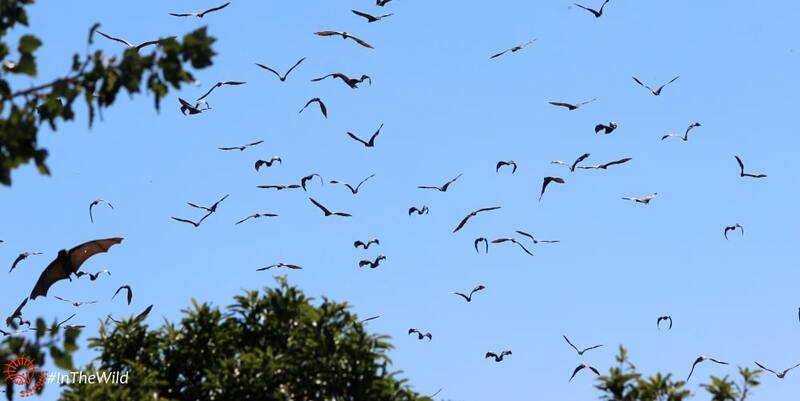 I would love to walk them in to the middle of the bat colony blindfolded, with no explanation, then remove the blindfold with a thousand flying-foxes above their heads, calling, socialising and flapping their magnificent leathery wings. But I know that the journey is as important as the destination, and this walk – all senses working overtime, the slow build to a crescendo of mass wildlife spectacle – is part of the experience. 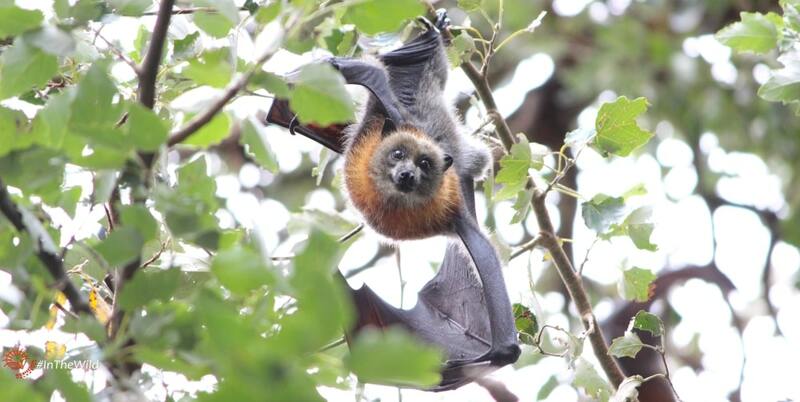 I pointed out one grey-headed flying-fox, high in a tree. It was a poor view, and I knew it would get better. Just wait, I thought. This is nothing. With much cajoling I get them away from the first three flying-foxes and into the main colony. There is nothing like it on earth. In Africa, if you’re lucky, you can watch 20,000 zebra walk by. In Antarctica you can look over 20,000 penguins, or even walk amongst them – if you’re lucky. 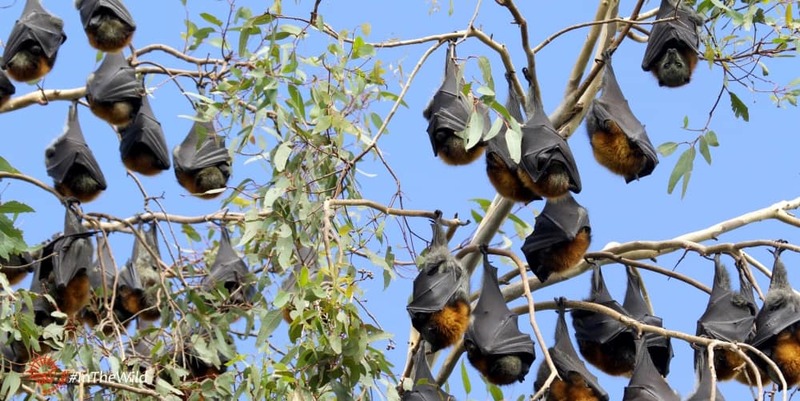 In Bairnsdale, East Gippsland you can stand under an umbrella of 20,000 flying-foxes, with almost every one looking at you. Every day. It is one of the world’s greatest wildlife spectacles, and one of the easiest to get to. Flying-foxes are beautiful, large fruit-eating bats in the genus Pteropus. There are other fruit bats (megachiroptera / megabats) through Africa and Asia, but the very large ones called flying-foxes only live in Australia, south-east Asia, India, Madagascar, the Philippines and islands in the western Pacific. 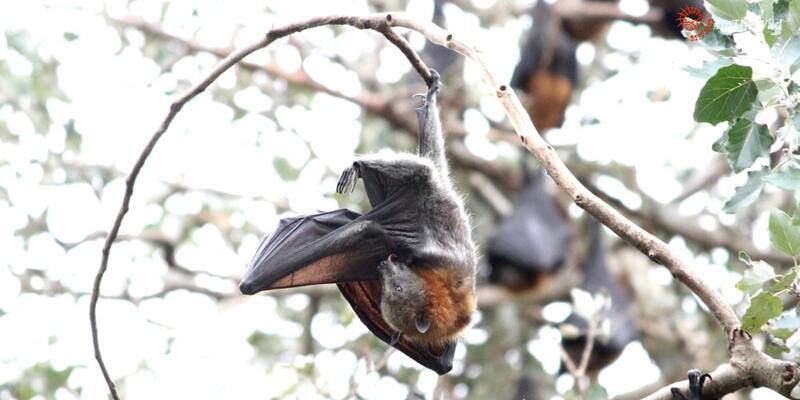 In Bairnsdale, most of the flying-foxes hang between 2 and 5 metres above your head. You can see into their beautiful brown eyes and see nervousness, curiosity, fear and even arrogance in the top-ranking males. When you first arrive many show fear, but if you stand quietly for some time they get used to you, and you almost become part of the colony. Grey-headed Flying-foxes are important pollinators of our forests. If we want to have trees, we need them. They are our front-line warriors in the fight against climate change. Sadly, though, our front line warriors are themselves being killed by climate change. 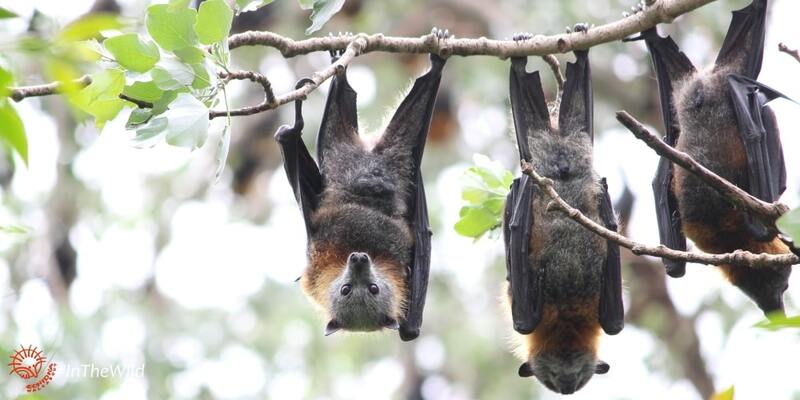 Read more about the Bairnsdale Bat Deaths in 2019. But not everyone understands their value, and some even try to harm them by destroying their homes. You can help them, by visiting them. 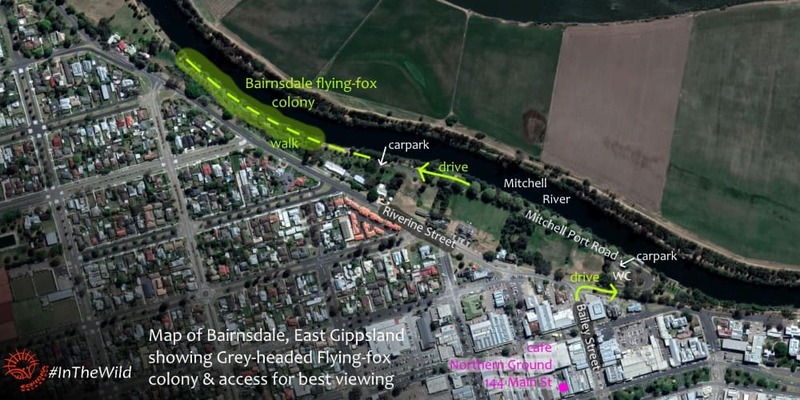 How to get the best viewing of Grey-headed Flying-foxes in Bairnsdale. Drive into Mitchell Port Drive from Bailey St or Riverine St. Its a downhill narrow 2 way road, with a big carpark, picnic ground and public toilet at the bottom of the hill next to the river. Drive along Mitchell Port Drive all the way to the western end. There’s a turning circle, and several carparks nearby. Walk west 100 metres towards the forest. The first flying-foxes will be there, or nearby. You should be able to hear them by now. The centre of the colony is about 150metres further along. You’ll know when you get there. Or come with us on the 4 day Wildlife Journey. 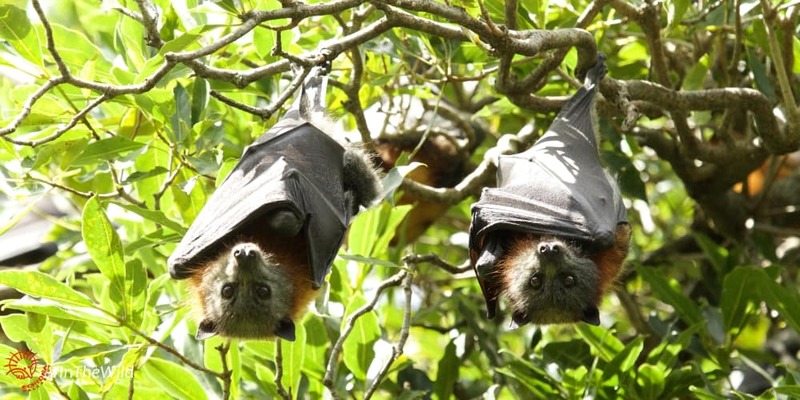 How you can help the flying-foxes, just by visiting them. After seeing the flying-foxes, we recommend you spend some of your hard-earned dollars in the town. Tell the shop staff you came because of the flying-foxes. Seeing economic benefit from wildlife helps local people appreciate and protect them. Northern Ground cafe at 144 Main Street, Bairnsdale. Sensational food and coffee. Open 8-5 not sure of days. Krowathunkoolong Keeping Place, Dalmahoy Street, Bairnsdale. Wonderful informative display about the Aboriginal People of Gippsland. Friendly staff. Open 9-5 M-F. There are supermarkets, liquor stores, fuel, lots of camping stores – everything you could need in Bairnsdale. 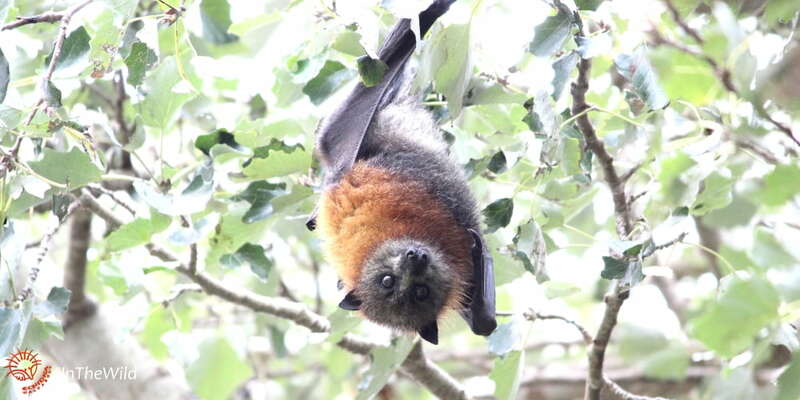 Conservation groups in East Gippsland campaign hard to protect the flying-fox colony from harassment and habitat loss: Friends of Bats & Habitat, Gippsland; East Gippsland Landcare Network, and a network of licensed wildlife carers. Walk slowly and quietly. Even though you will see other people running or cycling through the colony, flying-foxes notice if you make eye contact. So they are much more nervous of you, than they are of a passer-by who doesn’t notice them. Try to respect their space – if they start moving away from you, stop and don’t get any closer. At certain times of year flying-foxes are very territorial, so moving away from you might cause them to invade the territory of another flying-fox, which could lead to a fight. Read our tips on how to respect the space of wild animals here. Stay a while. They will get used to you, and you’ll see natural behaviour. Never touch a flying-fox, even if you find one on the ground. Call BADGAR Gippsland on 1300 223 427 or Wildlife Victoria on 03 8400 7300 on if you see an injured flying-fox, don’t attempt to rescue it yourself. Love flying-foxes? Want to see more? Our 6 day Wild Top End tour to the Northern Territory visits colonies of Black & Little Red Flying-foxes and sometimes we are lucky enough to see the mass flyout of the Little Reds.